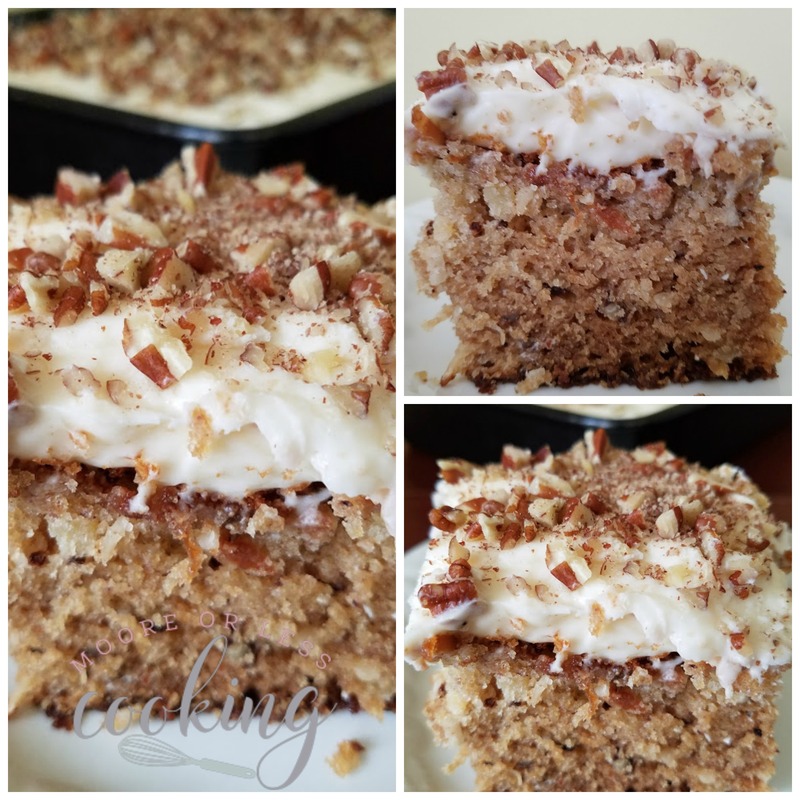 Preacher Cake~ Delicious and moist cake with pineapple, coconut and pecans. The title of this cake caught my eye as I scrolled through my recipes, searching for a wonderful cake to make for a large group coming for dinner. I was making two slow cooker entrees, so I decided that I could turn the oven on for an hour and not heat up my kitchen too much. Well, this cake was a HUGE success. Everyone went back for seconds. I made a 9 x 13-inch cake, so there was also plenty leftover. I sent home slices as care packages too. The coconut, pineapple combo is just wonderful. I thought if the preacher loves this cake, then it has to be a winning recipe! Everyone asked for this recipe. It’s perfect for a large party. The cream cheese frosting really makes it fantastic! This cake would also be wonderful as a layered cake or as muffins! Easy and delicious moist cake with pineapple and coconut, covered in a cream cheese frosting! Combine sugar, eggs, oil and vanilla and mix on medium-low speed with an electric mixer until creamy. Slowly mix in flour mixture until just combined. Spray a 13x9 baking pan with cooking spray. Pour cake batter into pan and bake at 350 degrees for 45-50 minutes or until cake is set in the center and a toothpick inserted comes out clean. Cool cake completely in pan then the frost with Cream Cheese Frosting. Sprinkle remaining ½ cup chopped pecans over cake. I would like to try this recipe, after scrolling the entire page several times I have yet to locate the actual recipe!! Thanks for letting me know Rick, it is posted now. Thanks, I just refreshed and found it, was beginning to question my sanity..